100% original brand watch with high quality. Quartz Watch with Silicone Band. Water Resistance 3 Bar(not recommend swimming and showering). Kid Waterproof Watches, Suitable for all occasions( home and travel, learning and entertainment), Bring you a different experience of happiness everyday. The best gift for child. 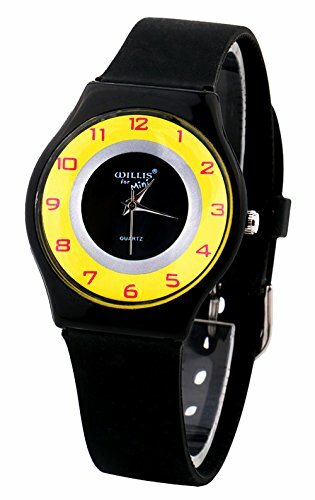 Quality material: classic black watch with yellow ring dial design, natural resin compact hard band, super comfortable soft silicon tape, can not be broken, easy to adjust. Professional technology: import high quality sports in Japan, maintain accurate time, and maintain power for a long time. Suitable for the crowd: sports and leisure style, the classic digital display window, easy to read, easy to learn, suitable for boys, girls, children, teenagers, children, and so on, over 5 years of age. Theme: family and travel, learning and entertainment occasions, giving you a good mood every day, this is a very useful gift for children. No worries after sales: Daily waterproof, but do not recommend swimming and bathing, etc., we do our best to provide products and services for our customers. If you have any questions about this product by Daystyle, contact us by completing and submitting the form below. If you are looking for a specif part number, please include it with your message.